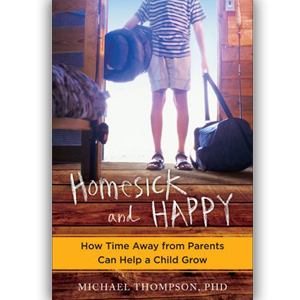 “Camp directors tell me that managing “childsickness” – parents’ longing for their absent camper – is becoming a bigger problem for them than dealing with homesickness,” Thompson writes in Homesick and Happy: How Time Away from Parents Can Help a Child Grow. Having just survived my older daughter’s first week-long sleep-away camp experience, I know exactly what he means. While my eleven-year-old child doesn’t have a telephone yet, I’m religious about keeping tabs on her whereabouts so it was a bit surreal to not know how she was spending her days. Give your child the gift of letting him or her go. Prepare your child for homesickness. Do no try to manage homesickness from a distance. Do not make the “We’ll take you home if you’re unhappy” deal. Help your children practice the skills they need before they leave. Use letters, postcards, and other slower forms of communication. Take a vacation from parenting, have some fun, and don’t feel guilty about it. Thompson realizes that sending your child to sleep-away camp requires your willingness to “let go of your importance in your child’s life to make space for someone else and new experiences” but it’s worth it. Camp is a magical time, which is why most people remember it so fondly. As I walked around camp on the day I dropped my daughter off, I was flooded with wonderful memories of hiking, crafting, and singing from my youth. While it was difficult to say good-bye, I knew I was making it possible for her to create wonderful memories of her own. “The essential difference between [school and camp] has to do with the high stakes of school and the lower stakes at camp. You could argue that camp is full of contests, competition, and evaluation,” Thompson concedes, however, “Camp contests teach you to be able to make a heroic effort, laugh about it, and move on. Camp contests, done right, are group play.” This, of course, is something sorely lacking in most school settings. If you still have your doubts, Thompson writes, “Perhaps the single most important finding in the camp research literature is that children who attend camp come home feeling independent and confident.” Since “true self-esteem comes not from praise but from real experiences of skill building and making a contribution to a community,” the camp setting provides kids something they really can’t get anywhere else. When I picked up my daughter yesterday, everything she’d packed was filthy and her eyes looked sleepy, to say the least, but she teared up when she said good-bye to her counselors and her cabin mates. As we walked to the car with bittersweet smiles on our faces and stories of campfires and horseback riding being told a mile a minute, I felt so good about having the courage to let her go. Clearly, this will be a week she’ll never forget.